The Hera Decanter has a punted design for maximum aeration. Holds 35 oz. Mouth-blown and lead-free crystal decanter. Personalize with name and single initial. Please Note: The font used for the script initial is "Edwardian Script"
IS THERE A SCREENED LID FOR DECANTER? BEST ANSWER: The Personalized Wine Decanter does not come with a lid or a stopper. The opening of the decanter is 2 inches. There is no lid of any kind on this carafe. Is the monogram on one side or both? BEST ANSWER: The Personalized Wine Decanter has the monogram on one side. Can I personalize with a date? BEST ANSWER: Please call our customer service department at 800.648.6058 and they can assist you with this. Is there a drying rack that would work with this decanter? BEST ANSWER: The Personalized Wine Decanter should work with the Large Folding Decanter and Wine Glass Dryer, item # 161 03 02. This was a gift for a friend and they really liked it, the engraving adds the personal touch that let's them know you took time to think about it. Reasonable price, classy looking and functional. I recommend this for the wine lover on your gift list. Beautiful decanter, nicely personalized and elegant. This was a Christmas gift for our son and his wife. They love it. The decanter looks great and the quality was as expected. The decanter looks very nice and engraving was done very well. It is not too large and easy to hold and pour. I like it. This decanter is very attractive and is a nice addition to our wine cabinet. So many compliments..
We gave 8 of them to our family and friends as Christmas gifts! And they all LOVED THEM!!! I think I will give them as wedding gifts! I got it for my husband for Christmas. He loved it. I first saw the decanter at my brothers home and really liked it. It seemed to take along time to receive though. Beautiful! Exactly what we expected. Great Christmas present for our daughter!! this was a gift for a dear friend who is a red wine lover and she really enjoyed this gift. Resonable price excellent glass and over all well received gift. I bought this decanter for my husband, and he absolutely loved it, it is very easy to handle, clean and store, it holds about 1 liter, and it looks great for a very reasonable price. It’s very pretty, good quality. Hope to use it for a very long time. It was a gift and the bride loved it. Ordering it was a breeze. David was extremely helpful. I love this decanter. easy to clean and handle while pouring. The personal logo is a nice touch. This decanter was a Christmas gift to my husband, who enjoys using it. The engraving and lovely shape make this decanter an elegant addition to our bar accessories! These are great. Gave some away at Christmas and everyone loves them. Good size, easy to handle. Work great. Was a big hit for it to be personalized. 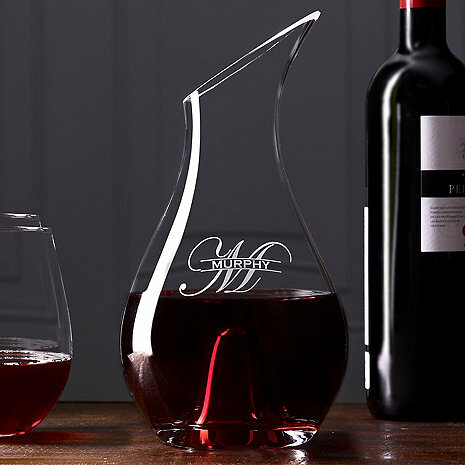 Great sturdy decanter with thumb hole in base for elegant pouring! Excellent value, very good quality, easy to pour. would be perfect if it came with a strainer. We own one of these and gave another as a Christmas gift. Very nice addition to anyone's wine bar. Lovely decanter and like the personalized touch! Reasonably priced. This decanter was sent to a friend. They were very happy with the decanter as a gift. The monogram in the pictures appears to be much larger than the actual size. The monogram is so small it is hard to see. I was pleased when it finally arrived. However, it was ordered in early December with delivery due before Christmas. It arrived 2 days after Christmas. I then had to pay to ship it again. Not sure it was worth the total price.